The Boston Globe's Pulitzer Prize—winning coverage of clergy sexual abuse of minors in 2002 led to what few would hesitate to call the most significant scandal in the history of the Catholic Church in the United States. In contrast, Catholics themselves disagree about whether the voting records of some Catholic politicians or the particular policies and practices of Catholic institutions might be called scandalous. Such questions often both reflect and intensify divisions within the Catholic community. Whether understood as negative public relations or as an action, attitude, law, or institution influencing another to sin, scandal affects the Catholic Church's proclamation of the good news of God's saving love. This makes theological reflection about scandal an essential aspect of being Catholic today. Failure to engage in this reflection risks truncating the tradition and obscuring the Good News. This book invites this reflection in order to understand differences in perception and judgment, make appropriate courses of action more clear, and enable Catholics to participate more effectively and authentically as a faith community in public life. Angela Senander, PhD, is associate professor of theology at Merrimack College in the Archdiocese of Boston. She has previously served as chair of the department of systematic and moral theology at Washington Theological Union, visiting fellow at Woodstock Theological Center, and research fellow at the Berkley Center for Religion, Peace, and World Affairs at Georgetown University. Her writings on faith, church, and public life have appeared in Prophetic Witness: Catholic Women's Strategies for Reform, New Theology Review, and America. Though her research is well-documented and supported, and is serious, objective, and scholarly, this book is not just for the academic theological community. This is a book all Catholics with an interest in their faith and a desire to know where they, as members of the People of God, are from, at, and going in public life. As a lecturer in undergraduate theology modules in dogmatic and moral theology, this book is now on my First Year student reading list as a highly recommended text for all stages of their degree's reading. As an interested Catholic, this book is also on my own personal reading list as `one to go back to,' time and again. College professors and lay Catholic groups seeking a way to encourage conversation about Catholic participation in public life, the need for respectful dialogue about divisive issues, and the place of dissent in a pilgrim church would do well to turn to this clearly written, hopeful book. Angela Senander's lucid prose helps make chapter 1, "Talk about Scandal," the best discussion of clergy sexual abuse that I have read. . . . A theological perspective of hopeful love for the Church, buoyed by a theology of grace and dialogue, characterizes the book and especially its conclusion. Scandal surrounding the church has influenced much of the hierarchy's responses to various issues, and Angela Senander writes with knowledge.. Scandal is a strong addition to any Catholic studies collection, highly recommended. [Senander] intelligently and intelligibly unfolds the distinct meaning of "scandal" in Catholic history and theology. . . . Senander offers a timely look behind the fault lines in the private and public life of the modern Catholic Church. 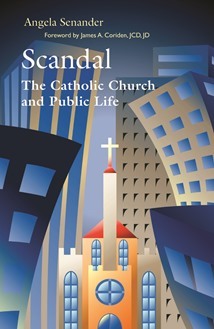 In this, Senander's first book, the Catholic ethicist and systematic theologian intelligently and intelligibly unfolds the distinct meaning of `scandal' in Catholic history and theology. . . . Senander offers a timely look behind the fault lines in the private and public life of the modern Catholic Church. By far one of the greatest contributions to contemporary discussions regarding religion. Its exploration of the meaning of "scandal" is superb -deeply insightful and rich in evidence. Senander's analysis of "scandal" in the Catholic Church left me feeling more "at home" in the Church while also demonstrating the need to honestly reflect on how these scandals impact and cloud our ability to see all that is good. The primary contribution of this book is a lucid and clear exposition of the many `stumbling blocks' (scandals) for the Church and the individual Catholic, both in the internal life of the Church and in its mission to the world. Senander's broad research is impressive, and she writes clearly, thus making the book accessible not only to the theological community but for all interested Catholics.